Let's get this out of the way immediately: No, Deus Ex: Human Revolution will not blow your mind or rock your world the way the original Deus Ex did so many years ago. But, really, how could it? Deus Ex has become such an icon of groundbreaking videogame design that a choir of angels practically appears every time someone mentions its name. So, no, Human Revolution isn't going to change your life, but that doesn't mean it's not looking incredibly damn good. Fair warning: Beyond this point lie spoilers, some more major than others. If you want to go into Human Revolution with a completely blank slate, I'd encourage you to go read something else. Before you go, however, know this: Human Revolution feels like Deus Ex. It's flashier, certainly, and has elements that have become commonplace in gaming (thanks in no small part to the influence of its legendary predecessor), so it's not quite as breathtaking as the original was, but it's Deus Ex, alright. The game begins in 2027 and humanity is at a turning point. A group of scientists from biotech firm Sarif Industries are preparing for a trip to Washington where they are scheduled to testify about their research, which the head of the company, David Sarif, refers to as "unlocking the potential of our own DNA." 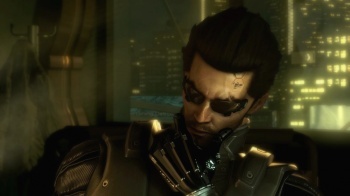 You are Adam Jensen, security specialist for Sarif Industries and ex-squeeze of Dr. Meg Reed, whose research led to the big breakthrough that's causing all the hubbub. After a brief look around her office, during which you can learn about a test subject who seems unusually well-suited to receiving physical augmentations (gee, wonder who that could be), Meg leads you through the halls of Sarif and does her best to convince you (and quite likely herself) that her research will be put to a use other than military offensive might. Shortly after you part ways, mercenaries break in, bust up the joint, grab Meg and leave you for dead. You're repaired, Six Million Dollar Man-style, and six months later return to work - coincidentally right before Sarif is due to go back to Washington. (You also seem to have healed awfully quickly. How very interesting.) Your boss wants you to meet him on the helipad, but it's worth poking around HQ a bit first. A bit of surreptitious email hacking and straight-up eavesdropping reveals that someone's been stealing drugs, and your nemesis, head nerd Francis Pritchard wants to discredit you by finding the culprit before you do. There are some doors just begging to be opened, too, but you don't have much time to muck about before Sarif is in your ear bugging you to get to the choppa with all due speed. It turns out that "purists" have raided the Serif factory that's making the Typhoon (an augment that launches mini explosives in a 360-degree arc), and taken a bunch of employees working overtime as hostages. Sarif wants you to go in and secure the Typhoon before SWAT gets sent in. Why? Interesting question. As for the hostages, if you can save them, so much the better, but if not ... it'll be time for a few more memorials at Sarif Industries.